WaterPORT – F*#k leaving the beach salty! We are all very aware of the current water situation in South Africa, it is to say the least disturbing! Cape Town experienced a drought (and still a concern), that almost put it on the map of being the first metropolitan city in history to have day zero for water L.
Durban beachfront’s recent upgrade, saw fancy electric showers being installed. Electric means wires, wires mean copper, copper means potential to be stolen! To find a working shower in Durban will result in you either walking the entire promenade or begging a lifeguard on duty for you to sneak into the tower for a 30 second wash down… highly unlikely to crack the nod! I have only mentioned two cities being called out for water problems but can guarantee there many more, but for now will focus on the issues experienced by beachgoers and leave the uses of this innovative piece of equipment for another blog covering the camping, sport and overland trips, which shows the versatility of this machine! Have a read below at the incredible features of this 15L day tank. The Waterport Day Tank takes the hassle out of manually pressurizing water by conveniently absorbing the water pressure from your home. Simply plug your garden hose into the tank’s quick connect and your Day Tank™ will automatically pressurize as it fills. The Waterport Day Tank comes with 3 mounting options: hitch mount, bar mount, and bed rail mount. These mounting options allow you to mount it to virtually anything you can think of: roof baskets, trailer hitches, ATV bars, RV ladders, boat railings, truck beds, roll bars, airboats, bike mounts…the list goes on! Need both hands to clean your camping dishes? We thought you might. 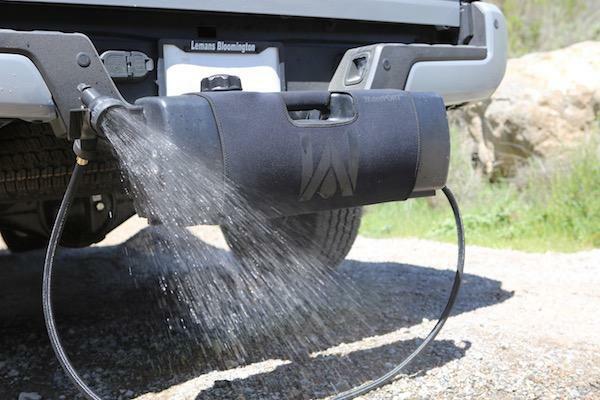 The Day Tank™ comes with a nozzle holder and trigger lock to provide you with hands free running water. Blast your gear clean with ease and keep your equipment looking like new. Our multi pattern nozzle turns your pressurized water into a swiss army knife. Use the mist spray for hot days on the boat, jet rinse to spray the mud from your tyres, shower setting for getting the salt off you skin, or center spray for cleaning dishes on the go. Life is full of messy situations…we have you covered. For more info on this rad necessity give our sales rep a shout, +27784572305 (Chad) and he will be more than stoked to pop over to where ever the hell you are to give you a demo!